The B-24 was heavily utilised in the North African and Mediterranean theatres by the USAAF's Fifteenth Air Force, with operations over the Ploesti oilfields in Rumania being some of the most famous missions undertaken by the big American 'heavy' in World War 2. The stirling work of the Fifteenth Air Force is often overshadowed by the glamorous 'Mighty Eighth', yet the men flying the B-24 fought ce… aselessly right through to VE Day. 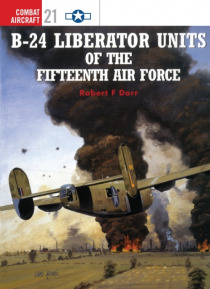 This is the third of five titles planned to chart the operational history of the Consolidated heavy bomber, and is the first single volume to exclusively cover the Fifteenth Air Force's B-24 units.